No need to order olives on your pizzas anymore… This gourmet mix contains 30% sliced olives (black and green) and 70% hot giardiniera relish. 8 oz. 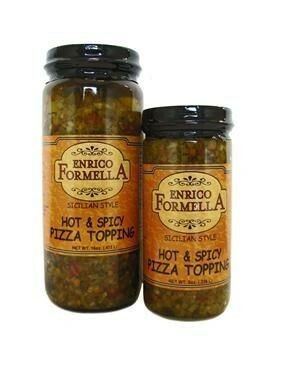 Hot & Spicy Giardiniera Pizza Topping	 each 8 oz. 16 oz. Hot & Spicy Giardiniera Pizza Topping	 each 16 oz.